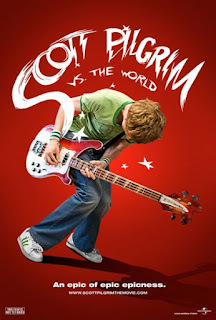 I had been aware of this movie for a while, but not aware that it was directed by Edgar Wright, who was also responsible for Shaun of the Dead, Hot Fuzz and other British films I had been fan of. I should have been paying more attention. I also didn't really become aware of what the whole plot line of this film was until quite late. It did look to me when I saw the previews that it was a typical film featuring a guy trying to get some inaccessible girl. Again, I probably wasn't paying attention, as anything sounding like a romantic comedy since Love Actually went as far with that type of movie as possible makes me role my eyes. Unlike many people, I have no opinion whatsoever on Michael Cera, so that never informed my opinion. Ah, the internet. The wonderful things it has brought us, and the horrors that it has wrought. 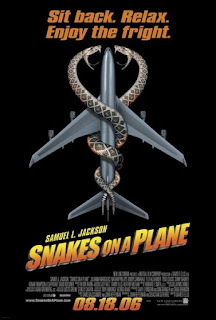 Famously, Snakes on a Plane came about from a contest to come up with the worst pitches for a movie ever. Somehow the idea got gained traction online, and Samuel L. Jackson even signed up for this hybrid of Under Siege and a low-budget Jaws ripoff, with the agreement that they would keep the name from the original draft. The result? Some fanfare, a good performance by Jackson as always, but just as bad as the pitch would have made it sound. Sean Jones (Nathan Phillips) is on vacation in Hawaii when he witnesses crime kingpin Eddie Kim (Byron Lawson) murder a businessman. He thinks he got away without being recognized, but Kim sends goons to kill him. Luckily, FBI agent Neville Flynn (Jackson) also knows that Jones was a witness, and shows up in time to protect him. Reluctant at first, Jones agrees to return to the mainland with Flynn and testify against Kim. Paul Feig said that one of the reasons he did Spy was because he knew that he would never get to direct an actual James Bond film. My question to him would be, "Why do you think you should?" If it was still the Pierce Brosnan era, I would think that it was because he couldn't do anything worse than Die Another Day, but with Daniel Craig the series has suddenly become something worth seeing again. Still, after 50-some years, it doesn't matter who plays the British secret agent, or for that matter an American secret agent of similar caliber. These movies have been done and redone, parodied and re-parodied, ever since Dr. No. There have even been female secret agents, most notibly Modesty Blaise. So why not try a fish-out-of-water comedy with one of today's famous comedy stars? Maybe it should not come as a surprise that John Cameron's two most well-regarded films are sequels. After all, he did start off with Piranha 2: The Spawning. He was still relatively unknown when Aliens was released, as his original film Terminator had yet to be released, but it was this and Terminator 2 that sealed his reputation. It helps in large part that Cameron didn't go the route many sequels in the 1980s, and even today, go. Many times franchises kept being the same movie over and over again, often times heading for New York or space when they truly ran out of ideas. 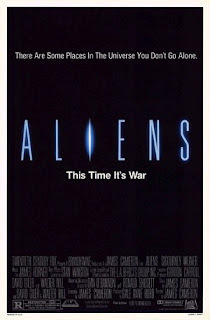 Theoriginal Alien was already a horror movie in space, and largely traded on atmosphere to overcome its low budget. It bucked a trend in science fiction films, where most were trying to rip off Star Wars at the time. No cute kids, no cute robots, just a run-down freighter with an acid-blooded predator with a drive to reproduce.